Readers are, I’m sure, aware of the massive problems caused by the waves of Islamic immigrants plus more waves of illegal immigrants from West Africa that have poured into Europe. The societal traumas that have been unleashed all over Europe due to this “open door” policy to millions of immigrants who do not share Europe’s cultural, religious and social norms have caused governments to fall or be in danger of falling. Poland, Hungary, Slovakia, and the Czech Republic are known as the Visegrad Four nations which oppose EU policies on immigration and the imposition of oppressive EU rules on member nations. Austria has flipped from a pro-EU government to a nationalist, Euro-skeptic government. Italy just flipped from a very pro-EU nation to an anti-immigrant, Euro skeptic-nation in its recent election. Of course, the United Kingdom voted to leave the EU, although the exact nature of its Brexit has yet to be determined. Resentment of the host populations against waves of immigrants who want to impose a hostile culture and religion upon the host nations has played a major role in the steady shift of Europe’s nations from a pro-EU position to an anti-EU stance. It has been a common perception that the EU has had a pro-immigrant policy all along. Based on public statements by EU leaders, Germany’s Merkel, France’s Macron and others, that seems to be a given. However, the EU has been heavily funding a physical border wall to keep additional Islamic immigrants out of Europe. Why has this wall not been noticed? It is because the wall is not on the EU’s physical border. It has been built, with EU funding, along the southern border of Turkey. By building a physical wall along Turkey’s southern border, the EU keeps a lid on the number of refugees entering Turkey which, in turn, puts a lid on the number of refugees entering the EU from Turkey. The first link and second link describe the extent and cost of this EU-funded, anti-immigrant wall. These links provide photographs of this substantial wall, which is at least 764 kilometers long! The EU has funded 80 million Euros to build the wall, another 30 million Euros to buy surveillance vehicles for the Turkish authorities to patrol the wall and these costs are on top of the $3 billion Euros the EU has sent to Turkey to fund its costs for keeping refugees inside Turkey instead of sending them to Europe. This is a lot of money spent by the EU to stop illegal Islamic immigration into Europe. This is the same EU which likes to posture that it is for “open borders” and that it is so pro-immigrant. This large EU expense to keep immigrants out of Europe indicates to me that even the clueless EU bureaucrats have realized the refugee crisis has the potential to not only overthrow the more pro-EU government in European nations but also has the potential to destroy the EU itself. 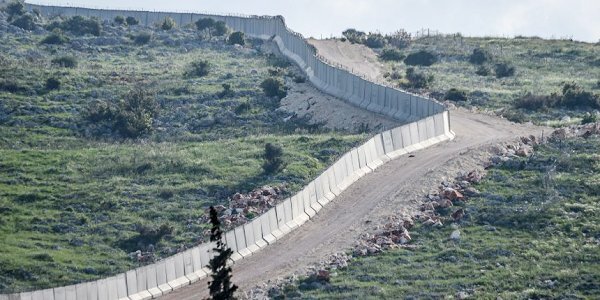 Personally, I think it is profoundly hypocritical for the EU to criticize Hungary for building a wall along its border to keep out illegal immigrants or to criticize the Visegrad Four nations for not wanting to accept any of the illegal immigrants accepted by the pro-EU nations when the EU is spending huge sums of money to keep illegal immigrants from the Mideast (almost all of them Islamic) out of the EU by building a large and long wall along Turkey’s southern border. The difference, of course, is in the motivation of national leaders for building walls and keeping illegal and/or Islamic immigrants out. Hungary, Poland, Italy and other nations who want no more illegal immigrants are taking actions to protect their inherent political, religious and cultural values from being overwhelmed and supplanted by a hostile culture. The EU leaders are building a large anti-immigrant border wall in Turkey to help the remaining pro-EU governments survive in office. The large numbers of Islamic immigrants in Europe’s nations have caused a major backlash by the citizens of those nations against the desire of the Islamic immigration to impose their religion and customs on the host nations (a fact the EU generally desires to soft-pedal). However, the Islamic immigrants have created “No-Go” zones inside a variety of European nations where the national police forces can scarcely enter safely. This used to be disputed, but no more. Even the pro-EU Chancellor Merkel of Germany has recently acknowledged the existence of European No-Go zones (third link). Hungary’s Prime Minister Orban has done the same (fourth link). In Sweden, it is reported that the Swedish army may have to eventually impose order in No-Go zones because it is too much for the police forces to accomplish (fifth link). In contrast to European leaders and nations acknowledging the existence of No-Go zones, the fact-checking website, Snopes.com, has labeled the existence of such No-Go zones in Europe to be a false claim (sixth link). This is a glaring example of Snopes.com distorting, or simply denying, a truthful reality to maintain Leftist, globalist fictions. Given that Snopes.com is so clearly wrong in this matter, it is easy to believe that it is not reliable when evaluating Left-Right political matters. The Bible has scriptures which directly address the stresses in Europe caused by the immigration of large masses of people who have no desire to assimilate into the host culture or religion. The Bible did allow for foreigners to immigrate into the ancient nation of Israel in the time of the Judges (Leviticus 19:33-34, Ezekiel 47:22-23), but these scriptures are easy to misunderstand. When Leviticus 19:33-34 states that strangers who “sojourn” in the land should not be vexed and should be allowed to settle in the Israelite nation, we need to define what the Bible meant by the word “sojourn.” It meant that these foreigners entering ancient Israel had to adopt the laws and culture of ancient Israel and renounce their previous gods and customs. A prime example of this fact is when Ruth, a Moabitess, accompanied Miriam to relocate into Israel and she announced to Miriam “Your people shall be my people and your God [shall] be my God.” This statement, in Ruth 1:15-16, meant that as an immigrant, Ruth was forsaking her old religion and her former gods and would henceforth serve and obey the Torah laws of the God of Israel. This meant she would be keeping the seventh-day Sabbath, the Leviticus 23 Holy Days, the Deuteronomy 14 meat laws, etc. Placing this in a modern context, if the Islamic immigrants who have poured into Europe were forsaking Islam and their former customs and were embracing the religion, laws, and customs of European nations, there would be vastly fewer problems inside Europe. That is, obviously, not happening. What is happening is the modern fulfillment of another biblical warning in Deuteronomy 28:43 that if nations invite a mass of foreigners into their midst who do not assimilate into the host nations’ culture, “The stranger that is within you shall get up above you very high and you shall come down very low.” This is what is occurring inside the EU nations as Islamic immigrants want to impose their religion and culture on host European nations. This is how “No-Go” zones get created and how they expand. Another biblical scripture which dramatically applies to what has happened inside Europe is the warning in Amos 3:3, “Can two walk together except they be agreed?” Whenever there is a major or irreconcilable disagreement on any kind of issue between people, nations, those entities cannot stay together for long. Wherever Islamic immigrants seek to impose or practice Sharia Law in their new residence zones inside Europe, they create an irreconcilable difference with their host nations who have their own sets of laws that must be obeyed. If this conflict persists and the inevitable problems this creates continue and worsen, it is possible that all pro-EU governments inside Europe will fall and be replaced by nationalist governments who will act to protect the host nation’s people and culture. This problem is not going to get better, and the EU nations who took in masses of Islamic and /or other illegal immigrants are finding out that the EU nations who did not take in waves of such immigrants are still refusing to accept them inside their borders. Many nations within the EU are essentially telling Germany, France, Sweden and other nations who took in large numbers of immigrants: “You wanted them, you keep them.” This is going to make for an ongoing and explosive set of civil and political problems inside the EU that will only fester and get worse. Italy’s new anti-immigrant government has adopted a set of policies regarding how to handle and process the masses of immigrants inside Italy, but the seventh link relates that the overriding new immigration policy goal of Italy is “sending home as many illegals as possible.” This policy goal will ensure the survival of Italy’s own historic culture. I think it likely that many other European nations will embrace that same policy goal.